Heated Enclosures vs Hot Box Backflow Enclosures - What's The Difference? Generally, when someone specifies hot box enclosures on the plans for a new building or is looking to buy a hot box, they are looking for a heated enclosure to protect waterworks equipment. The most common use right now is for backflow preventers. These heated enclosures can be made of aluminum or fiberglass. When used for backflow prevention protection, heated enclosures need to be ASSE 1060 certified. That means they are rugged and can be used to protect against wind and snow loads. They will also be lockable, and have adequate drainage. Different classes of ASSE 1060 enclosures will be either insulated or actually kept at a certain temperature by an installed heater. There are three classes of ASSE 1060, and the class 1 requirement states that the heater must maintain a temperature of 40° F even when the outside temperature is as low as -30° F. Other than in climates which require a class 1 enclosure, any brand of enclosure that has been ASSE 1060 certified will have the general characteristics needed to protect your equipment. From an insulated aluminum enclosure standpoint, there is no measurable manufacturing difference as a Hot Box® and a Safe-T-Cover™ enclosure - both comply with the requirements of ASSE standard 1060. There are, however, three key differences between our enclosure packages and Hot Box backflow enclosure packages. First, Safe-T-Cover offers a patented slab-mounted heater that is superior to any other enclosure heater on the market. The heater heats the slab as well as the air within the enclosure to keep the equipment from freezing in the winter. This heater meets the wet/damp requirement of UL 2021. The heater offered by most other competitors is a wall mounted heater. To our knowledge, there are few UL 2021 wet/damp certified wall mounted heaters. If the wall heater is not UL 2021 rated this means they must be installed high up on the wall to avoid contact with water. Since heat rises, the wall mounted heater is pretty much guaranteed to keep the top of the enclosure warm. It struggles to maintain the correct temperature for the riser pipes and the backflow device itself since the thermostat is installed in the heater, which is above the pipes on the wall. Second, the design of the Safe-T-Cover enclosure allows the roof panels to be removed in addition to the standard removable doors. This can be an important design feature, especially when a piece of equipment inside the enclosure needs to be replaced. Instead of dismantling the entire enclosure, the roof panels can be easily removed and the equipment hoisted from within. 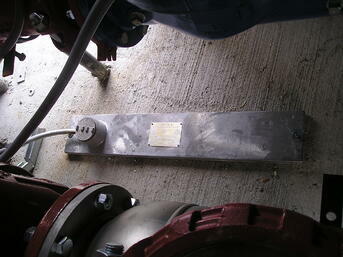 Hot Box backflow enclosures often have a hinged roof and it does allow easy access for repairs and testing. Hoisting is difficult with this system compared to a model with a removable roof. Third, Hot Box has a strong position in the smaller diameter market for 1” and 2” backflow devices with their fiberglass enclosures. They also offer larger enclosures in fiberglass as well. There are many differences between fiberglass and aluminum enclosures. Aluminum is more durable and is much more easily altered in the field. There is no need to worry about getting fiberglass shavings in your lungs or embedded in your skin when you need to add piping penetrations or other alterations to an aluminum enclosure. However, fiberglass is more reliable in certain caustic environments. That is important for certain uses, but backflow preventers do not create any sort of caustic environment and it's not a necessary consideration for the main use of Hot Box fiberglass enclosures. Regardless of these differences, either aluminum or fiberglass are simply more popular in certain geographic areas. 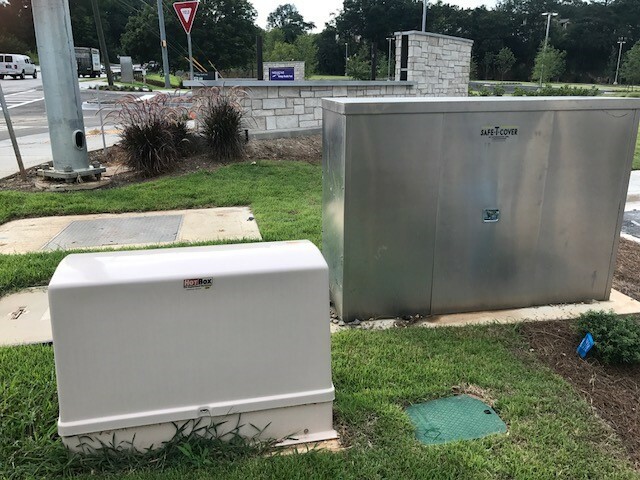 In some markets, the fiberglass enclosure is the only thing a plumber will install even when an aluminum enclosure costs the same and is more durable. But Wait, what is a Hot box Enclosure? In terms of the product alone, any heated enclosure is basically the same. The differences discussed above are more about the manufacturer's package that comes with the enclosure. Heater options, materials, and service are really all that separates most enclosure manufacturers. This is especially true of any enclosure that is ASSE 1060 approved. They've all gone through the same rigorous testing by the American Society of Sanitary Engineering. There is a bit more to the story. Why are heated enclosures commonly referred to as hot boxes? How did the company gain that popularity? Click here for the history of the hot box enclosure and a bit more of where the phrase comes from and why people use it as they do.